"You were made for this!" This phrase seems to be thrown around quite a bit these days: Sports commentators talk this way about athletes; teachers about pupils; mentors about those they coach. In short, it is a way of speaking that comes from a recognized "authority" on someone who is ascending in their field. It is language meant to boost esteem and put everyone on alert, that the next star is rising. In our celebrity-crazed culture, everyone wants to be special. Indeed "special" is the carrot that has motivated so many to aspire to greatness. I've felt this pull and have thanked God that my dreams of athletic glory were mercifully cut short. Still, the hunger for this kind of glory remains. And it remains with such a strong pull because we were made for glory! Not just some of us, but all of us were made to enjoy and exhibit the glory of God. And thus, until we discover the true source of glory, we will chase glory in vain. Therefore, we must see what Scripture says about the glory of God. In the beginning, when the glory of God burst forth in creation, the pinnacle of creation was Adam and Eve. And by returning to the opening words of Moses, we learn a great deal about glory then and glory now. In its original context, the "image of God" was a title reserved for the Pharaoh. In Egypt Pharaoh was understood to be a semi-divine, son of god. And writing to a people familiar with his exalted status, Moses used "image of God" language to speak of all mankind. Indeed, while the language of image and likeness is often misunderstood, the context of the ancient Near East provides the best context. In that period, kings set up statues throughout their kingdom---much like the Saddam Hussein erected in Firdos Square; the one torn down in 2003. These images were meant to remind the people of the ruler's power and authority. Likewise, the multiplication of the image throughout the kingdom represented the increasing size of the realm. Similarly, when God made mankind in his image, he intended for them to be fruitful and multiply and fill the earth. In this way, the glory of God would cover the earth---in the form of his people---as the waters cover the sea. This is what the image represents---through their words and word-directed actions, God's people reflect the One who made them, owns then, and calls them to live for his glory. At the same time, mankind was created to image-forward his holy character and beautiful glory. Indeed, so long as Adam and his offspring kept covenant with God, they would make visible his likeness to the earth. Thus, to be made in the image and likeness of God means reflecting our Maker's glory. Accordingly, 1 Corinthians 11:7 can speak of man and woman as the glory of God. Certainly, this glory was distorted in the Fall (cf. Romans 3:23), but in Christ it was recovered---in his humanity, he is the glory of God (Heb. 1:3)---and such glory is being restored to those who are in Christ (see 2 Corinthians 3:18). Even more, one day the glory of God will be perfected on earth, as it is in heaven. Still, all this speech of image-bearing and glory-reflecting can be somewhat abstract. What does it mean to reflect and radiate the glory of God? To answer that question, we need to see one more aspect of the humanity's creation---namely, the calling for men and women to be priestly servants in the kingdom of God. In the opening chapters of Genesis, seven commands are given to Adam and Eve. These seven commands can be grouped into two pairs and one triad. In these seven commands we find a world of instruction. First, as image-bearers God has called his children to increase in number and fill the earth with his glory. Second, as lords of creation, he has called Adam's family to rule the earth. Third, in covenant with God, he has called Adam and his family to serve as priests in the presence of God. Indeed, when we read the opening chapters of Genesis in light of all Moses will say in Genesis–Deuteronomy, it becomes clear Adam is more than a prehistoric farmer, he is in fact a king and a priest. As Psalm 8 captures it, the original man is crowned with glory and honor. Likewise, as we follow the storyline of Abraham, we discover how God plans to (re)establish a kingdom from the line of Abraham (see Genesis 17:6, 16; 35:11). Likewise, from the book of Numbers we learn every place the words "cultivate/serve" and "keep/guard" are used together is in regard to the priests and Levites of Israel (see Num 3:7–8; 8:25–26; 18:5–6; cf. 1 Chron 23:32; Ezek 44:14). In other words, to a people living out the laws of Leviticus, Genesis 2:15 would tell them---Adam is a priest. In fact, Ezekiel 28 also portrays the king of Tyre as a priest like Adam. Adam also is portrayed as wearing priestly attire in Ezekiel 28:13, . . . That this figure is Adam is pointed to by analyzing the description in Ezekiel 28:13. The jewels that are said to be his “covering” in Ezekiel 28:13 are uniquely listed in Exodus 28:17-21, which describe the jewels on the ephod of Israel’s high priest, who is a human and not an angel. In fact, either the Ezekiel list is an allusion to the human priest’s bejeweled clothing in Exodus 28 or Exodus 28 has roots in an earlier tradition about Adam’s apparel, which is represented by Ezekiel. (G. K. Beale, "Adam as the First Priest in Eden as the Temple," 10). In short, the glory of Adam is far more than a glow that hangs over the first man. The glory is related to his calling to be a royal priest. Indeed, this was the intention of every man and every woman. A look through the rest of the Bible confirms that royal priesthood is the goal of creation. Just consider a brief survey of the Bible. In Exodus 19:6, God calls Israel a royal priesthood and a holy nation. In Exodus 28, Aaron is appointed high priest, who is dressed in a royal robe. In 1 Samuel 16, David is annointed king of Israel, but later he will adorn a priestly ephod (2 Samuel 6:14). Though kingship and priesthood will be separated into the tribes of Judah and Levi, respectively, the intertwining of priest and king remains a theme throughout the Bible. In fact, throughout the Prophets, there is the promise of a coming royal priest who will bring salvation, Just as Abraham encountered a priest-king from Salem in Genesis 14, Psalm 110 promises a priest from the kingly house of David. The same promise is repeated in Jeremiah 30:21, Zechariah 3:1–10, and Zechariah 6:9–15--- to give an incomplete listing. Moving into the New Testament, Jesus is both the long-awaited king of righteousness (a Melchizedek) and a priest who lives to intercede for the people of his Father's kingdom. And finally, and most explicitly, Peter assigns the title royal priesthood to the church (2 Peter 2:5, 9), just as Revelation calls the disciples of Christ a kingdom of priests (see 1:6; 5:10; 20:6). In short, we cannot understand who Christ is and who we are apart from the twin offices of king and priest. Importantly, these concepts do not begin at Sinai or with David. They start in Eden and they will continue forever. Therefore, Christians who are tempted to chase the glories of this world must seen what true glory is. And that means we must consider what it means to be made in the image of God as priests who serve in God's kingdom and kings who worship in God's presence. To embrace such an identity in Christ not another kind of glory-seeking, another fool's errand to make ourselves something we are not. Rather, it is coming to grips with who God made us to be and what Christ has done in his work of salvation. 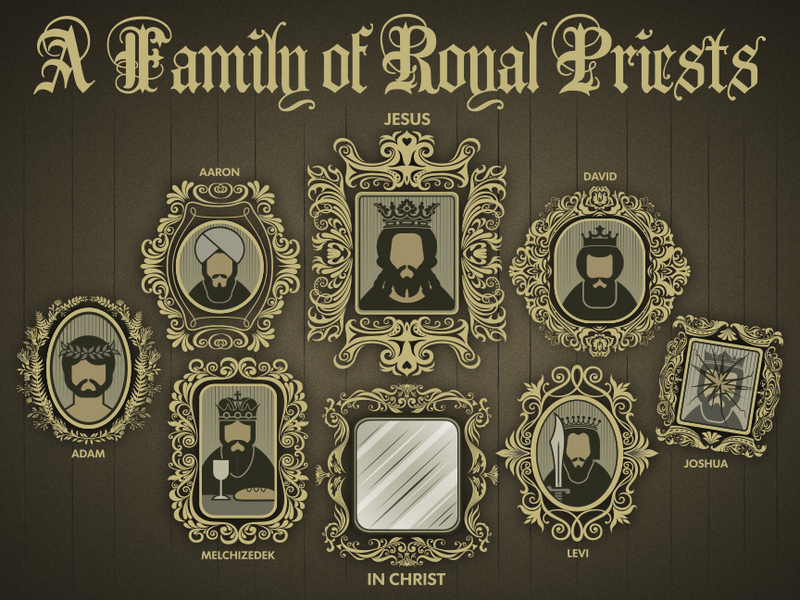 He is the true royal priest, and in him we also are royal heirs and holy priests. This Sunday we will begin a new sermon series tracing this very idea. And I pray it will open your eyes to the glorious calling of royal priesthood, so that you might be better equipped to live out your daily calling as a royal priest in the family of God.